While they might dream about what to do once they land, the companies and institutions seeking to reach Mars are currently more concerned with how to get there. NASA, SpaceX, and Mars One have all spoken about their goals for humanity as an interplanetary species, but for the most part these grand plans seem designed only to attract enough public interest and funding to develop the tools to reach our red neighbour. 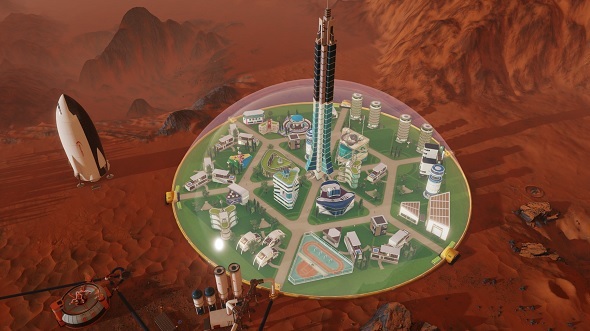 Surviving Mars, a city-builder from Haemimont Games – of Tropico 5 and Victro Vran fame – asks us not to concentrate on the journey to Mars but on what a Martian civilisation might entail. It is a game of maybes and what-ifs, the science provided for you and waiting for you to employ and interconnect it to fit your own colonisation dreams. If you’re looking for the best space games on PC then look no further. 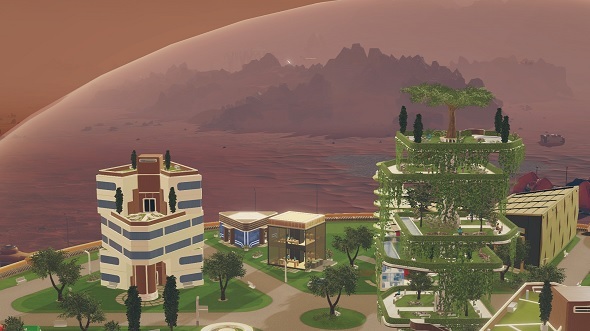 You might be set on taking advantage of the Martian habitat to advance science, selling your inventions back to Earth with a view to advancing the species and making you enough cash to continue your experiments. Or, you might be interested in social cohesion and developing that most scary and doomed of ideals: a utopia. On the flip side, starting from scratch on a new planet offers the chance to prove that harsh authoritarianism is the way to maximise achievement. There are enough options here to not have to define your approach so rigidly if you do not want to. But there is also enough danger and challenge to punish you if you don’t have some sort of longer-term plan. To an extent, you are asked to plan what kind of colony you want to create before you have even left Earth in your first rocket, as you have to choose a sponsor. Each sponsor offers their own mix of rocket quantities, social perks, hard cash, and selection of starting buildings and drones. As you might imagine, your choice can seriously affect how difficult the early parts of the game can be. If you want it easy then choose International Mars Mission as your sponsor. They are very generous, giving you four rockets to travel to Mars with, which allows for maximum wiggle room when it comes to transporting your initial supplies, buildings, and colonists. This means you will have enough food to feed your colonists if you fail in your early attempts to produce your own, and, as an added bonus, you are given a perk that prevents your people becoming ‘Earth sick’ and wanting to return home. On the other end of the scale the Russians give you just two rockets. However, they have a perk that boosts food production, so long as you can intelligently manage the increase in fuel demand it takes to achieve it. Your sponsorship decision is likely going to come down to what kind of game you want to play. Stick to the easier end of the spectrum if you want to concentrate on expressing yourself and growing your colony in your own image. Go for the tougher options if you want the red planet to challenge you and give you greater problems to overcome. Overcoming Mars, surviving its inhospitable nature, is not a wholly solemn exercise in Surviving Mars. Both visually and narratively, there are enough quirks and extravagances to charm, even if you have little interest in the science and realities of this most extreme and audacious colonisation attempt. 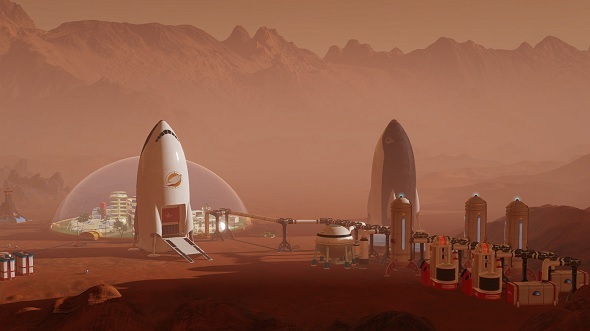 If you have watched any of National Geographic’s ‘Mars’ series, or seen SpaceX’s concepts for its human-made Martian structures, then Surviving Mars’s building palette will feel familiar to you. Almost every construction I have seen thus far adopts a tendency towards being spherical in shape and minimalist in patterning. Wind turbines and the structures within the habitat domes in which humans live provide juxtaposition to the spherical rule, but even these emit some degree of globular architectural bias. 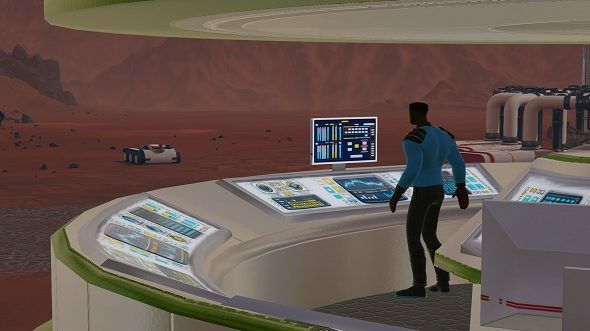 Surviving Mars, however, also embraces the retro-futurist aesthetic popularised in films like Logan’s Run, Demolition Man, and even Wall-E. The apartment blocks, drinking bars, and sports arenas within the domes are especially prominent in this regard. This embeds the entire game with a greater sense of wonder than an overly strait-laced approach based on our current understanding of what is possible would provide. In turn, this opens the door for greater interpretation of your role as puppet master and more intrigue as to what the next research upgrade might bring. Curiosity is further heightened by the inclusion of narrative threads that revolve around mysterious occurrences. During my time with the game I came across a series of jet-black cubes arranged in an unnatural pattern that, after investigation and testing, revealed themselves to be made of a useful material. Where did these cubes come from? Did someone or something make them? What do they say about the history of Mars? If used correctly and written with flair these mini-mysteries could act as a means of cutting through the harsh reality of survival and provide a diverse enough flavour palette to retain our interest over a longer period than Surviving Mars otherwise might. 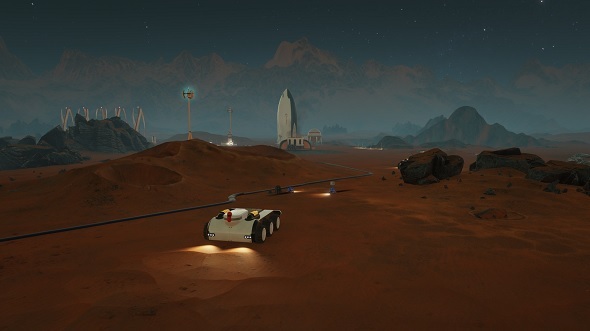 For certain, Haemimont Games have shown enough elements to convince me that Surviving Mars is a well thought out and lovingly created project. The mixture of familiar problems relating to social cohesion and resource management alongside the unique problems offered by Mars makes for a game that is at once welcoming and fresh. Now all the developers have to do, much like SpaceX and co., is prove that a long-term embrace of Mars is worth overcoming the problem of surviving on it.